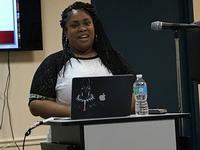 A little over a week ago, on the same day that a hate-fueled gathering was taking place in Charlottesville, Virginia, a group of teenagers was gathering at a small library in Philadelphia to talk about combating hate. The Philadelphia City Institute hosted the Free Library's second annual Social Justice Symposium for Teens on Saturday, August 12, featuring keynote speaker Angie Thomas, author of the #1 New York Times Bestseller, The Hate U Give. Angie talked about the legacy of Tupac Shakur, the idea of something beautiful, a rose, growing out of difficult circumstances, the concrete. Our teens were inspired by her words and her truth, as well as the powerful story she wrote about a girl who ultimately finds her strong voice opposing hatred in spite of her fear and the very real danger she faces for speaking out. One participant said about the program, "I liked learning about different issues in the community and realizing that as a teen my voice is powerful." The symposium also included afternoon workshops that allowed teens to explore their voices, their power, and the issues of systemic racism, economic and educational discrimination, and biased justice that impact them every day. Libraries are inclusive places where anyone can go—no matter your age, your racial or ethnic background, your economic or citizenship status, your sexual orientation or gender identity. We are here for you. We can help your find information that is trustworthy and important. We can help you connect with your community. We can give you a safe space when you need it most. For many teens across our city, our libraries are home. Have you found your library home? Stop in any neighborhood library location of the Free Library and introduce yourself to our staff. Ask us about programs, books, and resources for teens. Just like the other local organizations listed below, we want you to be free to find and define your best selves. We want you to feel that there is always a place free of hatred where you will be safe. Check out our Black Lives Matter Explore Topic, as well as the resources and booklists (Fiction and Nonfiction) listed below, to explore some of the topics we talked about in our symposium, and join the conversation.